2. Heat oil and butter in large skillet. Add garlic and shallots. Cook until lightly browned. 3. 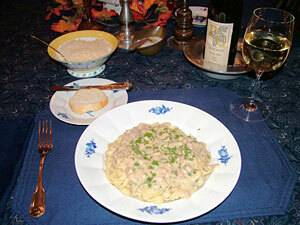 Add parsley, rosemary, tarragon and clam juice, (about 1 to 1 1/2 cups), heavy cream and white wine. 4. Bring to boil and simmer 15 minutes. 5. Add minced clams, salt and pepper to taste, cook 5 minutes. 6. Cook pasta while sauce is simmering. 7. Add 2 tablespoons Marsala to 2 tablespoons arrowroot. Mix well and stir into sauce a little at a time off burner until right consistency is reached. Do not boil after adding arrowroot. Note: I used one can of Capt. Mariner’s whole clams (available at The Grapevine Cottage) and minced them. If you don’t have Marsala, use white wine. If you have no shallots, use a little onion or leek or omit. This recipe is very forgiving, and easy to double.